Yesterday, our last contributor was doing his annual online investigations and together with a few other fans, started a series of findings. There were found images for a presumably new 8041 Race Truck set, which show the box, the B-model (a Race Car) and even partial instructions for the B-model, were found at technic.lego.com/nl. To me, it looks this might be some semi-exclusive or a late 1H release, rather than a 2H set. If you zoom significantly the box image, you may find a kind of a logo with something written like "Limited Edition", or similar. The Race Truck has steering and tilting cabin functions. New 1x5x11 Panel Plates in black, included. The Rhinoceros logo from 8285 returned in the stickers. Still have some doubts about the blue part(s) used for te seat. It seems to be a lot of free space on the drives side, which may ease to make some motorization and to place a battery. Interesting to see how the new 7L gear rack was used, avoiding a new 11L part. I guess this model could turn into a very successful sales case, specially among those fans initiating into TrTr or Technic Racing competitions. With a few Power Functions parts, it should be easy to modify for such competitions. A more detailed image from the B-model. But it does not end here. In fact it is not even where it started. 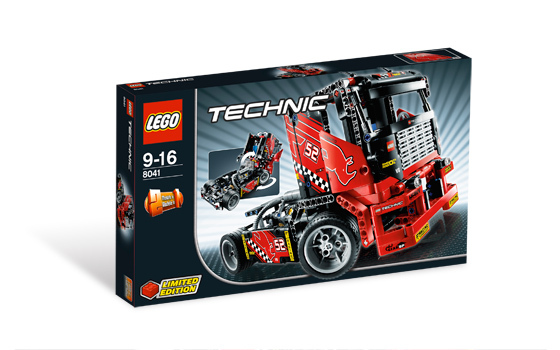 From a Dutch store there was also found some info about what probably are the LEGO Technic 2H2010 sets (descriptions bellow, freely translated). TBs : This looks really promising! Looking forward to see how TLG did make a successor for the 8420 Steet Bike. This however seems to have 3 cylinders instead of 4, new tires (the previous were just amazing), wonder how the new panels will fit. Loading and lifting containers? No problem for this heavy motorized container truck! Use the Power Function motor and the linear actuators to lift or lower the container and to put it on the back of the truck. Can be built into a dump truck. TBs : Personally think I would prefer a container stacker, but still very curious about this model. Quite predictable that the recent Panel Plates, would bring us this type of models, sooner or later. This realistic mobile crane can reach the entire contruction site. All wheels have steering and it can lift heavy cragoes with its telescopic arm that can extend to 60 centimeters. The four stabilizer can be extended if your turn the wheel at the back. Can be built into a harbor crane. The 8051 and 8053 are going to have something to live up to with the current models available. Looking forward to seeing the first images of these! The part that said 'heavy motorized' means the trucks is heavy, not that the motorization is heavy! But still, a heavy truck isn't necessarily going to have a medium motor in it... the 8258 being my reasoning. And after looking through the provided instructions for 8041, I noticed that it looks like there will be suspension and drive through the rear axle which will be interesting to see how it works, and I wouldn't be surprised if there are instructions for including power functions in 8041. I also wondered about the blue parts in the B-model. Don't look like oridinary beams. Maybe panels in blue? Indeed the 8051 and 8053 have a lot to live up to. The motorbike sounds quite interesting with it's three cylinder engine. Most likely it's an inline three mounted perpendictlar to the frame. It's been a while since they have done that. Nice to see it's got both front and rear suspention, tyres sound interesting to. As for the container truck it deffinately states actuatorS so it must have more than one which makes me wonder why. Both the container truck and the dump truck at this kind of scale would only have one use for an LA. I wonder if they are placed end on end as done with pneumatics to give them a longer reach. I guess we'll have to wait and see. I'm glad it comes with a motor to operate those actuators. The mobile crane, apart from all wheel steering, doesn't really offer anything new from a crane in terms of functionality. Sounds very similar to the XXL crane so I hope it's got some interesting new parts to make up for it. In saying that the last MAJOR flagship was this year so the next one will probably be 2011, seeing as they only come once every two years. I sincerely hope they ditched the yellow and blue and give us some blue or green trucks! I meant: hopefully the ditched the yellow and red and give us blue, green or orange trucks! Yes, I'd love to see the orange color to return into Technic sets. This time with large quantities, and wider part assortment. It should be exactly that part. Thanks! Quite creative use of that part! I am guessing 8053 Mobile Crane could be a Tadano Rough Terrain Crane. The description match perfectly to the real thing: It has only 4 wheels and all 4 wheels can steer, it have 4 outriggers, a long telescopic boom, have a small profile which allows it to be anywhere on site. Google "Tadano rough terrain crane" to have a rough idea how it looks like. I seriously want this set if it is really like what I said. For 8052 container truck, maybe we are going to have another 8258 with a large container bed/trailer? "I am guessing 8053 Mobile Crane could be a Tadano Rough Terrain Crane"
Good thinking. It does say in the description that it can reach anywhere in the construction site which makes it more likely to be something compact-ish like the 8270 or the 855. Hmmm that looks quite interesting. Would deffinately be very large. if we think about 8258 B-model, this could definitely be a logical follow-up. Never seen these. They look like a good challenge to build with LEGO Technic. 8041: cool! But I can't find the building instructions on technic.lego.com/nl. :? 8051 and 8053 sure sound cool but 8052 is the set I'm most curious of at the moment. I wonder what will it look like - and somehow think that orange would indeed suite such a truck well. Also... heavy motorized = XL-motor? So much for something new this year... I suppose a container truck is new but, I'm betting that's a small set. "No problem for this heavy motorized container truck! Use the Power Function motor and the linear actuators [...]"
How could any small set state that? I'm betting it's around the size of the Front Loader. Thought i would post some more pics of the larger container trucks it could be, i doubt it though because the number of pieces required would be a lot more then normal. Sigh... I wish the designers would consider something other than trucks or things with cranes. How about aircraft or a Supercar?